There’s one question that’s often asked of financial coaches and money experts: should I open a new credit card account because of the awesome perks? The answers will most certainly vary from one expert to another and there are nearly as many answers with justifications either for or against. We might not be able to provide that answer for your unique situation, we can offer a bit of information that will help you in your own decision making process. We all receive credit card offers in a number of ways and many times over the course of a month: email, traditional mail and ads that pop up on our computer monitors. Seems as though every credit card network has a “must have” that will complete our wallets. Sometimes these offers come with a bonus for signing up for a new account and sometimes they arrive with a preferable interest rate – even an intro 0% APR – for any existing credit card balances that we shift into the new account. For credit cards that have a rewards program, that’s often all some folks need to hear – especially if they’re saving up those points for a trip around the world or to offset fuel costs. It’s the prospect of a low or 0% interest rate or earning thousands of points or miles in a rewards program that serves the lure. Here is some credit card advice to take into consideration if you are thinking about opening a new credit card strictly for for the sign-up bonus. 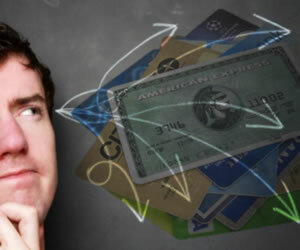 It’s more important than ever to closely examine fees associated with the new credit card. Look at the annual fee, as well as any recurring fees. If those fee structures look a bit costly, there’s a good chance that credit card offer is going to cost you money versus saving it. And make no mistake: the new fee structures, laws and current bills in Congress can throw you for a loop if you’re not paying attention. Assume nothing. If it’s the attractive 0% intro APR that’s caught your eye and you’re thinking you’d like to transfer a balance, be sure to calculate the transfer fees and take a look at what the APR will revert to following the intro period. There’s a very good chance you’ll still be carrying at least part of that initial balance along with any new charges you incur. Don’t underestimate the effects of time on an account – money’s money and when it comes to credit cards every day counts. Don’t underestimate the power of your credit score. Did you know if you apply for an offer, and if you’re approved, you might not have been approved for that initial draw? It might be the credit card company approves you, but minus the intro rate or bonus miles. Plus, you could be paying a higher interest rate than what you’re paying now. Do your homework and request a copy of your credit reports from the three major bureaus before you make a decision you can’t back out of. It’s true – you might have received an offer for a great rate and plenty of those perks you’ve been looking for, but if you’ll take a few minutes and check other offers at the various networks, you might see a better offer that could equate to hundreds of dollars a year. That’s easily accomplished by visiting the major brand websites, such as Visa, Discover, MasterCard and American Express. Also, double and then triple check the annual fees. Some of those yearly costs have doubled or even tripled in recent months as the credit card companies look to make up some of their lost profits due to the 2009 CARD Act. The fine print matters! In fact, it matters in ways like never before. With all of the new regulations in the financial sector, not reading the terms and conditions is as big a mistake as not completing due diligence on competing offers. Pay Attention to the fine print and make no assumptions when it comes to your credit card rewards program. Some credit card companies with airline miles rewards programs limit your options via blackout dates, fees or other sticky guidelines. It could be you find yourself struggling to maintain your patience as you seek to redeem your points or rewards for a flight to your high school reunion. If the rewards aren’t serving their purpose, you don’t have the right card. Also, check the expiration dates. While it may seem overwhelming, the truth is, it’s actually supposed to be easier. The trick is making sure you remain your best advocate as you work your way through the many offers on the market today.